Container gardening in Calgary breaks new ground when it comes to gardening in small places. One can achieve a lot cultivating veggies and other edibles in tubs, pots, half barrels and other containers. It doesn’t matter if you have a small yard, only a balcony or a patio within your reach, containerized gardens can play the part quite nicely. Gaining popularity over regular gardens, container gardening has become a favourite in Calgary where time and space have turn out to be inadequate –shifting the earlier perception where a plot was needed in order to enjoy the ‘traditional’ practice of sowing and reaping. Container gardening can compliment your existing landscaping Your containers can be placed on your patios, porch or even at the side of your walkway. 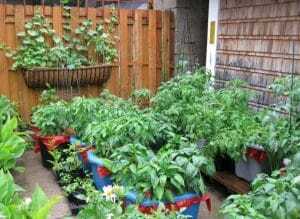 Almost anything can be grown in a container, be it flowers, shrubs, herbs and even vegetables. However, avoid jumping on the gun trying to plant your seeds for another bountiful season before taking your precious time to learn about the planting seasons in Calgary. To make container gardening successful in Calgary, the know-hows in planting strategies, watering strategies and managing soils must be learned if you want a a decent yield. It’s important to note that container gardening not only augment the beauty of your serenity, but can also provide for you a variety of fresh edibles when done well. Unimaginable results have been obtained from the simplest experiments in container gardening. Plants have blossomed, air freshened, food provided and such successes have been attributed to endowing factors such as; well drained containers, good mix of soil and regular maintenance with fertilizers. Some containers usually come with drainage holes. Those that lack are modified to add them. Other ways of increasing drainage include raising the container above the ground and adding a layer of course gravel below the growing medium, as in the case of large containers. Proper drainage will prevent plant roots from rotting because of stagnant water. Notably, soil with high clay content should not be used in container gardening. This is because such soils, obtained from your garden, prevent adequate drainage. So the best growing medium to opt for should be a potting mix which provide excellent drainage, sufficient air and nutrient rich mix of soil that would be favorable to your plants at different situations. This is an important practice as plants would regularly need water and fertilizers so as to replenish nutrients and moisture lost in the available soil. Also, deadheads (wilted flowers) can be removed to create room for further flower budding. A simple pot or a container can be a blessing in disguise, especially when it comes to container gardening. Many people have enjoyed watching the little seeds they planted nurture into wholesome vitamin rich food and a beautiful sight to behold. To draw you closer into reasons why you should start a container gardening in Calgary. Here are the benefits of container gardening from this ancient and convenient practice. With adequate light, containerized gardens can be placed at any available space; be it your doorstep, balcony, courtyard, patio, rooftops and can even be placed indoors. They are ideal for cities where apartments are the order of the day. Containerized gardens can be moved about with preference to sunny or shady conditions. Also, considering the Calgary weather condition where it can be sunlit one moment and the next snowy, container gardening allows you to move containers indoors when circumstances are unfavorable. It brings gardening closer to your reach and even makes it accessible to kids and the elderly. With container gardening, you are completely in control of the soil of quality you need and the type of plant you want to grow, especially when your garden has unfavorable conditions. One can also change the look of their garden or house with various color schemes, features and heights. As the legend goes, the impressive Hanging gardens of Babylon (one of the Seven Wonders of the World) was very striking and all it took to have that glam and become envious to the eyes of Henry the VIII was the resilient agricultural culture of container gardening. You can recreate such a fun, whimsical, productive and urban garden right here in Calgary.